Don 2 Trailer Featured on RottenTomatoes.com! 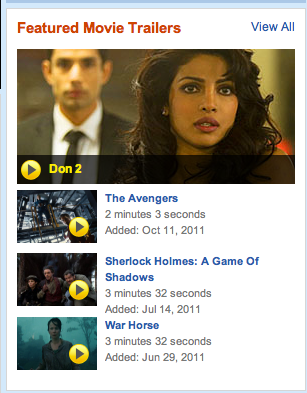 If being featured on IMDB was not cool enough, now the Don 2 trailer is the first featured trailer on the Rotten Tomatoes Home page! Not only that, it is featured above big Hollywood upcoming films like The Avengers, Sherlock Holmes 2, and Spielberg’s War Horse! How is that for cool! In case you don’t know RottenTomatoes.com is a website dedicated to movies, movie ratings and the discussion of films. Many people use the movie ratings on the site as a barometer for films being good or bad. If you have ever see the fresh red tomato (certified fresh and good) or the green splat (poor ratings) that means it has been rated on the site’s Tomatometer. In fact, Apple on its pages shows the Rotten Tomates rating on the movie pages in iTunes. Not only does Rotten Tomatoes take in critics’ ratings but also the ratings of people who are passionate about films whether it be love, hate or merely just like. Flixster.com and RottenTomatoes.com are the leading online destination for movie enthusiasts with over 30M unique visitors per month and 2 billion movie ratings. Check out the trailer on the home page. We think Don would like! And though we are sure you have watched the trailer check it out on the Rotten Tomatoes homepage in fabulous HD quality here! This is the first Bollywood film to have its trailer featured prominently on the frontpages of both IMDB and Rotten Tomatoes! Don is taking over and we think that totally rocks! Starring Shah Rukh Khan, Priyanka Chopra, Boman Irani, Om Puri, Lara Dutta and Kunal Kapoor, director Farhan Akhtar told us that this Don is as action packed as he could make it. Don 2 hits theaters on Decemeber 21st in the UK and the rest of the world on the 23rd! 17 queries in 0.549 seconds.